At the last World of Pinot Noir I met with Ryan Hodgins, the very personable winemaker at FEL Wines in Anderson Valley. His current Pinot Noir releases are outstanding, so I wanted to know the story behind the wines. In 2009, Cliff Lede, proprietor of Lede Family Wines in Napa Valley, expanded into Pinot Noir, Chardonnay and Pinot Gris with the acquisition of Breggo Cellars in Anderson Valley. 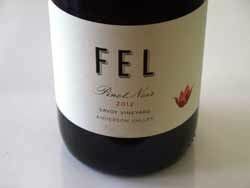 In 2014, as tribute to his mother, Florence Elsie Lede, Lede renamed the brand FEL Wines. She was known for her home winemaking hobby and sparked Lede’s curiosity in wine when he was young. 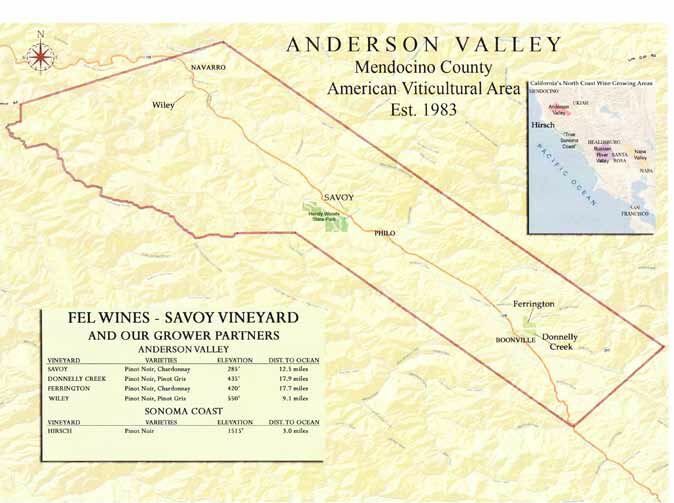 p,> In 2011, Lede bought the Savoy Vineyard in Anderson Valley, known as one of the premier Pinot Noir and Chardonnay vineyards in the North Coast region of California. The vineyard was planted by Richard Savoy in 1991, and encompasses 44 acres of diverse sub-blocks planted to a wide array of Dijon and heritage Pinot Noir and Chardonnay clones and selections. Fruit from Savoy Vineyard is also sold to Auteur, Failla, Littorai, Peay and Radio-Coteau among others. Winemaker Ryan Hodgins buys fruit from other vineyards in the Anderson Valley and Sonoma Coast for the FEL portfolio’s of single-vineyard bottlings. The full array of wines includes: Anderson Valley Pinot Noir, Anderson Valley Chardonnay, Anderson Valley Pinot Gris, Savoy Vineyard Pinot Noir, Savoy Vineyard Chardonnay, Ferrington Vineyard Pinot Noir, Hirsch Vineyard Pinot Noir, Donnelly Creek Vineyard Pinot Noir, and in select vintages, Savoy Spiritus Pinot Noir. Raised in Portland, Oregon, Ryan attended Oberlin College in Ohio, where he majored in biology and developed an interest in plant biology and winegrowing. He considered several careers after college, but wine seemed most interesting and he soon attended University of California at Davis where he graduated with a Master’s Degree in Viticulture & Enology. He met his wife at Davis, who is also a viticulturist. His first handson experience in vineyard and winery work was during a harvest internship while at Davis under mentor Brice Bagnall, the winemaker at Witness Tree Vineyard in Salem, Oregon. Upon graduation in 2004, Ryan worked at Acacia Winery in Napa Carneros, leaving to accompany the winemaker at Acacia, Michael Terrien, who left Acacia to become the winemaker at Hanzell Vineyards. While working as an assistant winemaker at Hanzell Vineyards, Ryan became the founding consulting winemaker for Breggo Cellars in the Anderson Valley in 2005. When Cliff Lede acquired Breggo Cellars (now FEL) in 2009, he asked that Ryan become the full-time winemaker. When Lede bought Savoy Vineyard in 2011, it became the winery’s first estate vineyard. Ryan was very familiar with the vineyard, having made wines for Breggo from Savoy Vineyard, and it was only natural that he became the vineyard manager and grower relations manager for Savoy Vineyard along with his role as winemaker at FEL. Ryan’s Pinot Noir vinification is straightforward. Grapes are largely de-stemmed with some limited amounts of whole cluster based on intuition (in 2014 he did include 20% to 30% whole clusters in the bottom of the tanks primarily in the AV blend and Savoy Vineyard wines). He prefers not to make wines that make people think of whole cluster first when they smell the wines. Generally he employs 5 to 7 days or longer of extended maceration with the amount of tannin driving the length of time decision. The wines are aged 15 months in barrel without racking. FEL’s Anderson Valley grower partners include Donnelly Creek, Ferrington and Wiley vineyards. Beginning in 2012, Ryan began sourcing wine from outside Anderson Valley, and was able to obtain some much-prized grapes from Hirsch Vineyard. Today, Ryan crafts 5 Pinot Noirs, 2 Chardonnays and a Pinot Gris: a total of 7,000 cases annually. The wines are sold online at www.felwines.com, through wine clubs, and a mailing list. The generous 2012 vintage provided plenty of wine to go around. Read more about Ryan in the last page of this issue in the “Up Close and Personal” feature.